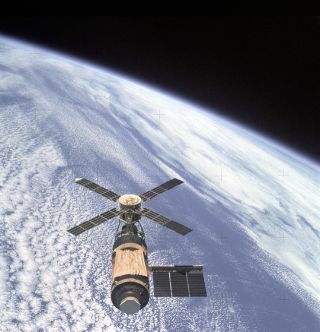 The Skylab Orbital Workshop experienced a failure that led to a replacement shield to protect against solar heating. In this historical photo from the U.S. space agency, an overhead view of the Skylab Orbital Workshop in Earth orbit as photographed from the Skylab 4 Command and Service Modules (CSM) during the final fly-around by the CSM on Feb. 8, 1974, before returning home. The space station is contrasted against the pale blue Earth. During launch on May 14, 1973, some 63 seconds into flight, the micrometeor shield on the Orbital Workshop (OWS) experienced a failure that caused it to be caught up in the supersonic air flow during ascent. This ripped the shield from the OWS and damaged the tie downs that secured one of the solar array systems. Complete loss of one of the solar arrays happened at 593 seconds when the exhaust plume from the S-II's separation rockets impacted the partially deployed solar array system. Without the micrometeoroid shield that was to protect against solar heating as well, temperatures inside the OWS rose to 126 degrees fahrenheit. The gold "parasol" clearly visible in the photo, was designed to replace the missing micrometeoroid shield, protecting the workshop against solar heating. The replacement solar shield was deployed by the Skylab I crew. This enabled the Skylab Orbital Workshop to fulfill all its mission objects serving as home to additional crews before being deorbited in 1978.